Auto Mod 101: What Is A Muffler Delete? When it comes to mufflers, the team at Park Muffler is the place to go– after all, it’s in our name! Modern vehicles boast highly advanced exhaust systems, meaning mufflers are sleeker, more durable and more efficient than ever. Many current vehicle owners may have not even considered their muffler or their exhaust systems. Whether that sounds like you or you are an avid automobile modifier, consult our crash course below for more info. A muffler is a device that provides a sound-dampening function for the entire automobile’s exhaust system. Just as it name implies, it muffles the noise created by the heat and vibration of an internal combustion engine. Once clunky, restrictive and unreliable, newer model mufflers are vastly improved and horsepower-friendly. Common in custom auto circles, a muffler delete is a term that pops up on occasion among vehicle owners. Again, the name is very straightforward– a muffler delete is a process that removes the device from the exhaust system for various reasons. In the past, removing a muffler could offer many benefits to a vehicle owner concerned with performance. This boost in horsepower is less drastic with newer vehicles as they are designed to be less restrictive. Modern automobile modifiers generally opt for a muffler delete to increase the volume of their vehicle. Louder exhausts can be a contentious issue, but as long as your vehicle doesn’t exceed the legal decibel limit for sound pollution. Generally, a muffler delete is not major enough to break these laws– but always consult with your local regulations before undertaking any vehicle modification. 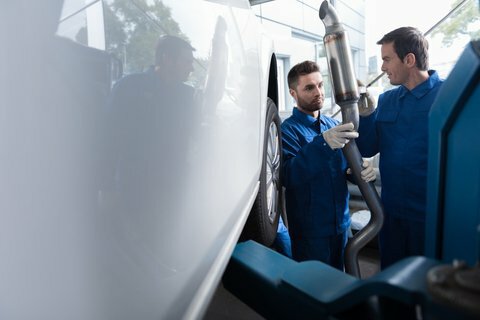 The questions above are only a summary of the concerns you might have about your vehicle’s exhaust. Noise, emissions and performance all need to be considered– so contact or visit Park Muffler today for a full consultation.